It took me a long time to find it, the best souvenir of a trip to Madrid. I don’t eat ham, and I don’t believe it travels particularly well. I couldn’t possibly contain the energy and giganticness and overtouristed and hot and sweaty and perfect glass of gazpacho at any time of the day, and three food markets of varying quality and traditionalness and tired feet and so many espadrilles and a sun to rival any that has shone on me in all of my life. But I could go to the Rastro, the sprawling, many blocks-long flea market where they sell clothes old and new, and telephones, and cookie tins and the occasional mannequin head, and all those other goodies that you find yourself pawing though while on vacation, even though you spend careful time making sure no trash comes into your house when you are at home. Not me. I needed nothing, other than some underwear, which I am not posting here, and which I did not buy there. I was mainly in Madrid because I was giving myself a few day cushion in Spain on the way back from Portugal, so that if I missed a plane or boat, I would not find myself without a flight back to South America, where I’m generally supposed to be. I was happy to wander the streets at all hours of the day and night, go to the Reina Sofía, and not exactly remember having been there before, but then remembering that the first time I saw Guernica, I cried. I studied in Spain in the summer of 1993, and my older sister came to visit me, and we showered in our pajamas before bed, in the shower I had in my room (but yet, no toilet), at my pensión near the metro stop Sol, because summer in Madrid is heinously hot. And I remembered going to the Rastro, and someone asked me where I was from (because this activity appears to be timeless), and when he found out, he said what sounded like “junkielandia,” and I responded that yes, we had a drug addiction problem, but it turns out he was saying “Yankeelandia,” which I only figured out later. Or maybe they thought something else entirely. I was only there for three days, and didn’t dig very deep. Except in a large box of postcards, where I limited myself to just one, though there were many good ones. 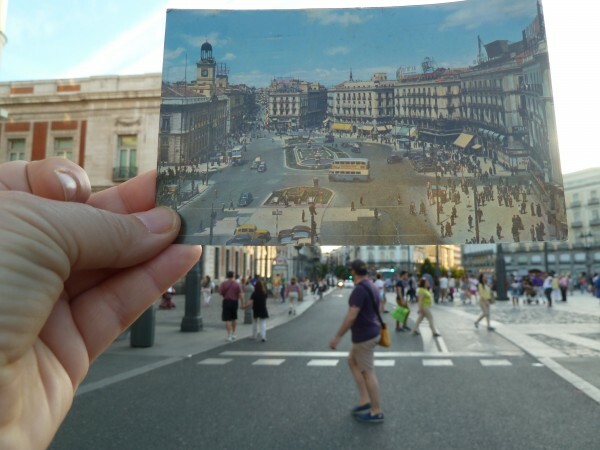 Above is the photo side of the one I picked, sent in 1956 from Madrid to Oviedo, and later found in a box on the ground in the Rastro in Madrid, purchased by me, brought back to where it was shot, where I tried to make a composite, and imagine a time when round-topped busses rolled down the streets. But the traffic was heavy and I had to stand in the middle of the street to take the photo, and it was hot and sunny, and after a while I wandered off to go look at something else. Depicted on the front is the Puerta del Sol, a major metro transit point, a huge confluence of pedestrian-friendly shopping, and long a central point of tourist and local Madrid, and where I lived for part of that 1993 summer. 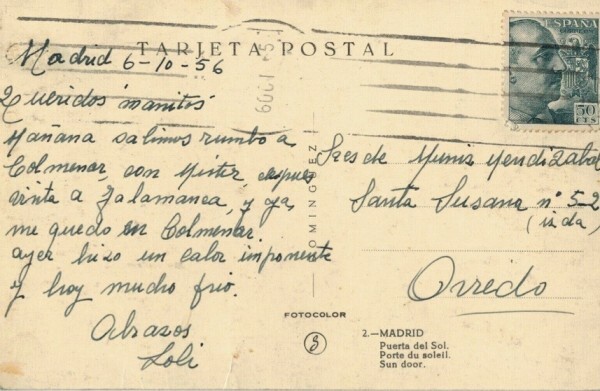 On the back of the postcard is a note from Loli, dated October 6, 1956, telling her little brothers that the next day they’ll be leaving for Colmenar, later to Salamanca and that she will stay in Colmenar. Predictably, it had been hot the day before, though this particular day was “very cold.” I can’t find statistics on weather from 1956, but I’m guessing “very cold” meant in the 50s. One thing I really like about this postcard is that it’s been sent away, but somehow came back. Usually when I find a postcard that is “of” the place where I found it, it has not been written on, or sent. It’s only a 4.5 hour drive these from Madrid to Oviedo these days, but I imagine it was quite a trip at the time. For another composite into a scene (this one of a photo), here’s one I did in Arequipa, Peru, a few years ago. Pleased as punch with this souvenir. Hope you enjoyed it, too.